The Tide approached the per-player record, but as expected, didn’t quite top it. The Tide’s No. 1 2019 recruiting class finished with a 94.38-point per-player average 247Sports Composite rating for each of its 27 signees, behind only 2017 Ohio State’s currently listed 94.6-point average per player among all classes ever rated by the Composite. Therefore, if you go only by average player rating, Bama just signed the second highest-rated class by anyone ever. If you go by total score, the Tide still finished comfortably in the top 10 all time. In the following scenarios detailed as potential routes to Bama challenging Ohio State’s record, the only variable player who ended up signing was four-star Ishmael Sopsher. The far majority of Bama’s class was already signed back in December. Below is a pre-Signing Day forecast showing how close the Tide could’ve possibly come to having the highest-rated per-player average ever. When we’re old and gray, we can tell our children of that one year when Alabama didn’t have the No. 1 recruiting class. 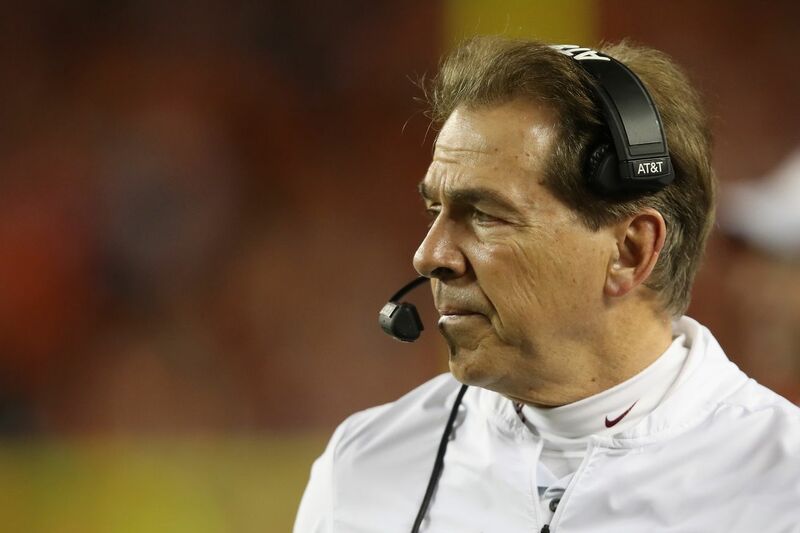 The year was 2018, when the Tide’s seven-year run with the best class by 247Sports Composite rating came to an end, and they finished fifth behind Georgia’s top spot. “But what happened the next year?” the child will ask. That the Tide will finish with the No. 1 class is not in doubt this year. What is in question is just how good that class will rate historically. The only non-blue-chip talent is the kicker (and he’s the No. 1 kicker in the class). On the day before February’s Signing Day, the Tide had more top-100 talent signed than the entire Pac-12. That meant the most compelling recruiting race at the top of the rankings was likely to be at No. 3 (Georgia’s gonna finish No. 2). 247Sports’ Composite and most other services rank classes by total commitment ratings. By that measure, the Tide will likely end up in the top five all-time with around 318 points, per 247’s scoring system (only two or three teams clear 300 in a given year). But that measure is weighted to favor quantity. Teams able to sign bigger classes might rank more highly than teams who are bringing in better players. From a quality perspective, if the Tide could finish with a class that has a 247Sports Composite per-player rating average of 94.6 or higher (out of 100), that would beat Ohio State’s 2017 class as the best class ever by average star rating. For this post, we’re primarily looking at the latter, but will touch on the former. Here’s the all-time top 15 entering this cycle from both perspectives, led by 2010 Florida (total class score) and 2017 Ohio State (per-player average). The short answer on whether Alabama can finish at 94.6: almost certainly not. They will come very close if they sign their remaining four commitments. That’d land them with an average rating of 94.31, the second-most efficient class ever rated. The problem is the Tide’s class is already maxed out. They’ve signed 24 players, with four outstanding verbals (although one, DB Christian Williams is probably going to flip and sign somewhere else, and another flip possibility is DL Khris Bogle), which would make for 28 signees. That’s their limit. The Early Signing Period also means there aren’t many flippable/unsigned players still available to bump the average up either. If Williams or Bogle do flip and they replace them with even the best unsigned player in the country as their 28th signee, the Tide would still fall short, landing at 94.53. That player’s five-star OT Darnell Wright, who at least has verbal interest in the Tide. He most likely won’t sign with the Tide, but it’s slightly possible, just for the sake of argument. Still, we’re talking about Bama signing probably the second highest-rated class ever, based on a per-player average rating. The only thing that can stop that from happening is if Bogle flips (and that’s with or without Williams also flipping) and isn’t replaced. With Bogle out of the class, the ranking drops slightly to third or fourth all time, depending on who replaces him in the class. But it still isn’t getting over 94.6. With just Williams out, the average actually slightly improves. But not over 94.6. Now, let’s get creative with Bama’s scholarship math. And not in an insidious way — let’s just play the hypothetical and say a player doesn’t qualify or something, and the Tide end up getting 29 spots in this class or even 30. Going back to the quantity discussion, that’s also the only way it can best Florida’s 2010 class at 324.82 ratings points. If they sign this group of 28 (including Williams and Bogle) and add Wright, they’d still fall short of the 94.6 average (it’d be 94.49 when rounded up). If they sign 30 players: There are a few ways it’s possible to eclipse that 94.6 number — unless ratings change over time. One is if they sign the 28 they have (including Williams/Bogle) and five-star running back Jerrion Ealy (also a target, and the second-best unsigned player remaining) as well as Wright. Wright and four-star LB Henry To’oto’o would also work with rounding. Another plausible combination is adding four-star DT Ishmael Sopsher and Wright to the 28. But even that mythical 30-signee Bama class merely ties Ohio State’s 94.59 number when rounded. If they sign 29 players: There is no way a 29-player class with either Ealy, Wright, Sopsher, or To’oto’o as player No. 29 in addition to the 28 that they have can get over 94.6. But you could take Williams out and use any combo of two out of those four players besides Sopsher and To’oto’o and get over 94.6 with 29 players. A class of 29 must have Bogle in it to get over. If they sign 28 players: Both Ealy and Wright replacing Williams and Bogle would round up to 94.6. If they sign Wright as the 28th player instead of either Williams or Bogle in the class, it won’t get over 94.6. If they sign Ealy as the 27th player in the class without Williams and Bogle and they sign Sopsher or To’oto’o as No. 28, it won’t get over 94.6. Long story short: Alabama will have to settle for merely signing Nick Saban’s highest-rated recruiting class ever.